B/G Twins at 28 weeks! I am 5'4 and just tipped the scale at 200 lbs (which is HUGE for me)!!! Our last ultrasound measured baby A (girl) to be 2 lbs 2 oz. Baby B (boy) to be 2 lbs 5 oz. We will be setting our c-section date in two weeks!! I'm 4'10" had twins naturally. Full term to my due date and weighed 5lb 13oz and 5lb 7oz afterbirth weighed 5lb 13oz I looked like a ball. 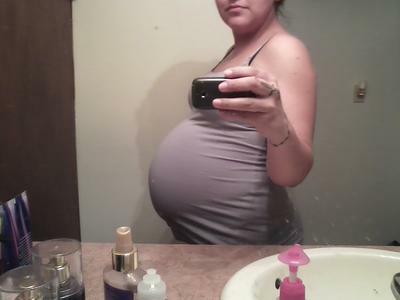 This picture was me at 28 weeks, I made it to 36+6 weeks!! We did try for a vaginal birth but the ultrasound showed that baby B was a no go for the vaginal so we had them via C-section. It was not fun having to recover from the surgery and it was hard getting around but you learn to know your limits and take the help that is offered:)I was in labor all day and didn't feel it so it was a good thing we went to the doctors office or we may have had the twins at home:) Thank you all for the comments and good luck to all you other twin moms!! You can do it!! You look amazing! I'm 5'4 too and 18 weeks with fraternal twin boys! You started out much tinier than me but you really do look awesome! I hope I look as good as you do in 10 weeks! Right. Why have MAJOR surgery if you don't have to? I was dead set against having a c-section, mainly because of so many complication risks. I delivered my twin girls naturally and I was so glad I did. I couldn't have made it through the week that followed if I was recovering from surgery. You bounce back so much faster without a c-section. If your doc says the c-section is your only option, find another doctor! they do them mainly for their own convenience, not for your best interest. My other children were born vaginal and I would love to have these two the same. I am just worried that if baby A comes out ok then B dosent I dont want to heal in two places and try to take care or the twins and our other children. My last baby before these twins was born at a hugh 9 lbs. 14 oz. so I have no doubt I can have them naturally. Baby A has been breech the whole pregnancy as well, Baby B has been under my ribs transverse butting heads with his sister. So if by some miracle they turn the right way and move into position then I will not take the c-section, its just waiting and seeing. Why are you having a scheduled c-sec? Why are you having a scheduled c-sec? You don't have to. I had my twins w/ natually started labor at 38 weeks 2 days. I'm only 4'10 and gained 12 pounds of baby. The labor was natural, too.